The American dream of a house in the suburbs with a neatly trimmed lawn and two cars in the driveway is giving way to a new trend as buyers are flocking to “walkable” residential communities in urban settings. According to national polls, half of Americans — particularly people under the age of 35 with college degrees — want to live somewhere walkable, where they can safely and easily walk from their homes to stores, banks, restaurants, schools and even their place of employment. The National Association of Realtors examined this trend and its impact on real estate development at its Legislative Meeting & Trade Expo last month. Christopher Leinberger, professor at George Washington University School of Business (GWSB) and president of LOCUS, a national coalition of real estate developers and investors who advocate for sustainable, walkable urban development in metropolitan areas, told the Realtors in attendance that residential walkable communities generate four times the tax revenue of regional and business malls, bringing more value to the area. 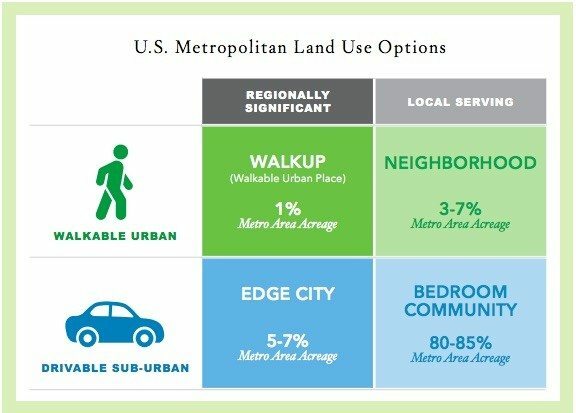 “Walkable urban regions in the U.S. have a 41 percent higher gross domestic product over nonwalkable regions,” Leinberger said. That’s because individuals who live in walkable areas usually spend about 43 percent of their income on housing and transportation, compared to those living in nonwalkable areas, Leinberger said. An infographic from LOCUS’s “Foot Traffic Ahead” study. “If a family can get rid of one car, they can increase their mortgage capacity by as much as $150,000,” he said. It may come as a surprise, then, that real estate developers, investors, land use regulators, public sector managers and residents in Michigan — a metropolitan area that for decades has been the center of the car and truck manufacturing industry — are seizing the opportunity to create walkable residential communities there. But according to a recent report issued by Leinberger’s organization, after decades of disinvestment, there is significant demand for walkable urbanism in many Michigan areas, as evidenced by competitively prices homes and rentals in urban areas in the last few years. The report, “The WalkUP Wake-Up Call: Michigan,” issued at the LOCUS Michigan Leadership Summit by GWSB in partnership with Michigan State University, examined the top seven metropolitan areas across Michigan, including Detroit-Ann Arbor, Grand Rapids-Muskegon-Holland, Lansing, Jackson, Kalamazoo-Battle Creek, Saginaw-Bay City-Midland and Flint, and concluded that home prices per square foot in most of these areas are more attractive to buyers than homes in drivable, suburban locations. Other industry professionals are cashing in on the trend. Walk Score, originally launched in July 2007, helps people determine the “walkability” of an individual home with an algorithm that awards points based on the distance to the closest amenities. The company’s Walk Scores run on many home detail pages on Zillow. Many real estate agents also feature a Walk Score “badge” on their listings and advertisements.